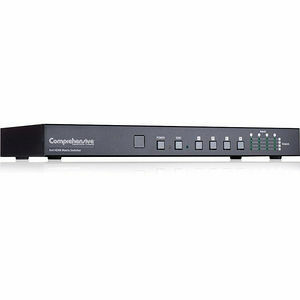 The Comprehensive CSW-HD444K is a 4x4 HDMI 4K x 2K Matrix Switcher which allows a HDMI signal from any of their four sources to be routed to and displayed on any of four connected HDMI displays simultaneously. With fast switching technology the device can greatly eliminate the time required by swapping or turning on/off the connected displays. It supports 3D, 3Gbps bandwidth and resolution support up to Ultra HD 4K x 2K, 48-bit Deep Color, Hi-Def lossless audio and other features defined by HDMI specifications. The management of source/sink scenarios can be operated easily through on-panel buttons, IR remote controller, RS-232 or IP control.